Quite some time ago I did a blog post about some research out of Israel on personalized glucose responses. The study helped people test their own unique glucose response to various types of foods, then created personalized diet plans based on those foods. They found that some foods that were normally considered “healthy” caused extreme responses in some people, while some foods often deemed “unhealthy” were fine. I had mentioned that I wanted to try a similar experiment on myself, and yet I never did…..until now. I tested all of these at midday, noon or 2pm. Glucose response can vary over the course of the day, so I decided to try midday on weekends. The tests below happened over a series of weeks, but all at the same time of day. Each serving was 50g of carbohydrates. I’ve seen people do this with “effective carbs” (carbs-fiber) or portion size, but I decided to do this with just plain old carbs. I ate all the food in 15 minutes. The times below represent “time from first bite” but I tried to make sure I had finished off the portion at around the 15 minute mark. I tried not to do much for the first 60 minutes, just to make sure the readings wouldn’t be changed by exercise/movement. I’ve only tried each food item once. Technically I should do everything twice to confirm, but I haven’t had time yet. Wow, cherries, what did I ever do to you? I was interested to see that so many fruits were identical, with one major outlier. I would never have thought something like pineapple would be so different from cherries. 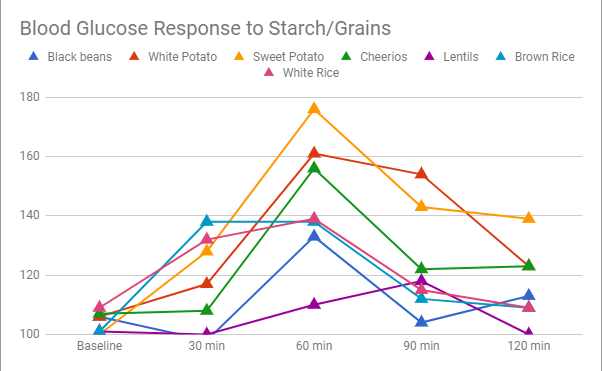 While I should probably repeat the measurement, it kind of supports the idea that some food responses are a bit unusual. I was surprised how much higher the variability was. Overall I thought these results were very interesting, and I’ll have to consider how to use them going forward. My next step is going to be to try to expand this list, and then move on to some junk food/fast food/takeout meals to see if my response is significantly different to things like burgers and fries vs pizza. That should be interesting. I’ll probably base that on a serving (or at least the serving I eat) as opposed to carb count. If I get really crazy I may try some desserts or maybe some alcohol. You know, for science. Let it never be said I’m not willing to suffer for my art. I would never have thought something like pineapple would be so different from cherries. My experience with chewing fresh pineapple is that it takes more chewing than most fruits, which leads me to the conclusion it has more fiber than most fruit, which would lead to slower digestion and thus a slower rise in glucose. After a strenuous, sweaty hike, there is nothing better for re-hydration than an entire pineapple. If you are really thirsty, it is no problem to consume one. In the tropics, a fresh pineapple is also a safe water source. I see more difference than you do between white and brown rice. 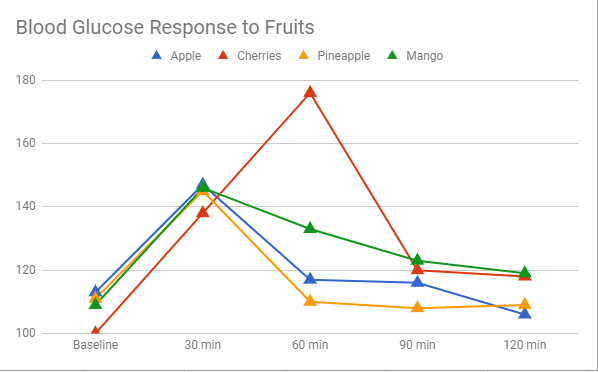 Double checking it, it looks like cherries actually have more fiber in them than pineapple. Still though…there could be something about the pulp or something else. Alternatively, it could just be that some part of cherries doesn’t agree with me or my blood sugar. In the initial study I think bananas were one of the foods they found varied dramatically from person to person, but no one’s really clear why. Pizza is terrible–no good idea why–but ice cream isn’t bad. BTW, you might find it amusing to make the same measurement several times within a minute or so. AccuChek had a somewhat tighter distribution than ReliOn (and there was a slight offset, but on the whole the pairs of numbers tracked fairly well). Your baseline numbers suggest that your gear may be better. IIRC they’re only required to be within a certain percentage of the real value. I know when I worked in a clinical lab we accepted repeat glucose readings within +/- 10%, so I’m guessing the at home tests are at that level or less. I’ll be interested to see how different junk foods do. One of the ideas behind the whole study was that if you could get people off of the junk foods that effected them most and replacing them with the ones that effected them less, they would see improvements. At least in the short term it seems to work that way (for their study), but I’ll be interested to see if it helps me. I cut out a lot of carby stuff, and the quarterly test says it helped somewhat. Not enough for my tastes, though. Yeah, I suspect the benefit probably comes from within food group swaps (rice vs pasta, for example) rather than food group for food group. No, got that backwards–much less of a kick, carb for carb. Sleepy.